So, we all trust Heavenly Recordings right ? They were quick to recognise Swedish singer-songwriter Lea Emmery’s innate ability to pen soaring evocative guitar driven pop as she produced demos under the name ‘Kid Wave.‘ The result was a deal with Heavenly, Kid Wave became a band and they released their debut album ‘Wonderlust’ a fabulous collection of songs and our album of the year in 2015. So it’s safe to say that we f**king love Kid Wave and will yield to no none in our deeply held view that Lea is among one of the finest songwriters to emerge in recent years . The good news is Kid Wave are back, and their latest tune ‘Everything Changes’ is a spectacular return. It’s the sound of a band stepping up to the next level It also sounds like an artist brimming with confidence and ideas, it’s shimmering, wistful, evocative life-affirming and moving. The mark of a great songwriter is their ability to communicate feelings and atmosphere to display real emotional intelligence and also produce tunes that aren’t genre specific. Seriously ‘Everything Changes’ could work just as well if it was performed acoustically, electronically, sung in a tin bath or covered by Springsteen in a huge arena show, to rows of swaying iPhones. It’s that good. Kid Wave are that good, and that’s one thing that won’t change, certainly not if Lea continues to write songs of such quality. 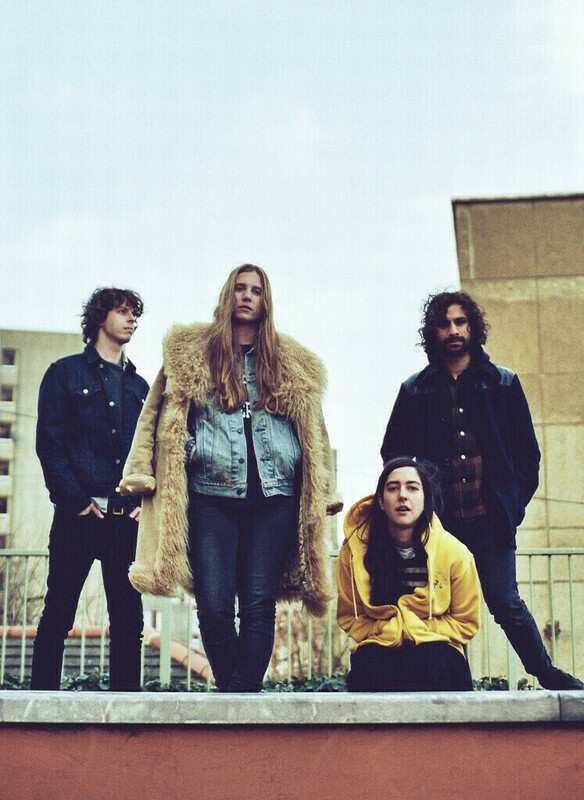 Bringing new friends Serra Petale (drums), Mattias Bhatt (guitar) and Harry Deacon (bass) on board to complete the line-up, and with a stream of loud gigs behind them (“It’s a lot more rock’n’roll live,” she says), Kid Wave released their debut LP ‘Wanderlust’ this year. And as the sun-drenched fuzz of ‘Gloom’ and the blissed-out ‘All I Want’ make clear, it’ll be a sound that’s perfectly suited for a hazy summer. London based four piece Kid Wave’s debut album ‘Wonderlust’ is without doubt one of our favourite albums of 2015 so far. It’s a stunning collection of songs and reaffirms our view that singer, songwriter, guitarist, and Kid Wave lynchpin Lea Emmery is one of the brightest new talents to emerge in recent years. There’s a beautifully uncontrived openness and straightforwardness to Emmery’s literate dreamy compositions, combining melodic buoyancy with an overarching sense of wistful longing. But rest assured this is not the place for agonised navel gazing and self-flagellation, there is no doom-laden introspection, rather a sense that here is somebody trying to assimilate their own experiences and make sense of their place in the world. ‘Wonderlust’ is perhaps an album that could only have been written at a certain time in your life, and although it’s refreshingly free of cynicism it is in no way naïvely optimistic. However the underlying mood isone of celebration, conjuring up a sense that Emmery and her band cohorts reside in a world in which hope will always win out over gloom. Musically Kid Wave combine classic guitar riffs with soaring blissed out pop hooks, evoking a youthful unconstrained ache for adventure, and discovery, whilst at the same time eliciting a sense of wistful nostalgia for those endless summers and limitless horizons when the possibilities seem infinite. There’s nothing that remotely resembles a filler on the album – Gloom despite the title is anything but, and is, in fact, one of the finest examples of life-affirming guitar pop and rock you’re likely to hear in this life or the next! Honey is all driving propulsive splendour, I’m Trying To Break Your Heart is simply stunning, Sway is as hypnotic as it is majestic whilst Best Friend aches and shimmers with a yearning beauty that few songwriters can muster. There’s no pretension, no arch agenda, Kid Wave aren’t here to push boundaries, break taboos, or f**k, with your head man, but they may well capture your heart. They are content to write elegant beautifully crafted escapist music, and what they have achieved with ‘Wonderlust’ is to produce an album that will surely resonate with anybody who has been young and dared to dream.They’ve also contrived to make this writer’s world an infinitely better place for the near forty-minute span of the album. And sometimes y’know, that’s all you need. 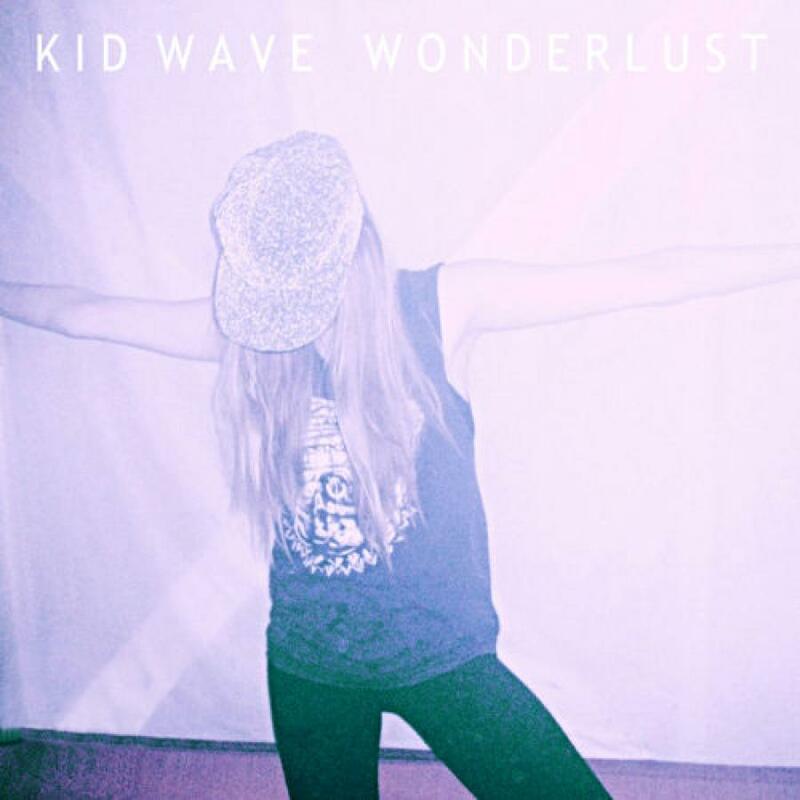 Kid Wave from London, Wonderlust. It’s an aptly-titled for an international band whose founding members’ wanderings lead them to congregate in the capital. Kid Wave began life as a solo when Lea Emmery relocated from Norrköping (a city sometimes referred to as “Sweden’s Manchester”) to London in 2011 at the age of 18. She knew no-one, had no band, no contacts. But she did have drive, vision and ambition – insane levels of it, in fact. Several years playing classical piano at a local college in Sweden had lead to a stint in an all-girl punk band and though that tenure was short-lived, there was simply no turning back. Noise beckoned. 2014 saw Kid Wave playing shows with The Wytches, TOY, The Orwells, Childhood and more recently with Jimi Goodwin at the Heavenly 25 weekend in Hebden Bridge. In autumn 2014 they recorded Wonderlust at the magical analogue wonderland that is Eve Studio in Stockport with producer Dan Austin (Doves, Cherry Ghost). Beyond the studio the lashing rain and dark north-west nights were banished by the youthful exuberance and sugared sounds being created within. Because Kid Wave sing escapist song of struggle, desire and yearning: songs born out of Lea’s lonely years as a teenager adrift in a foreign country, where the hope of musical success and a superhuman level of stubbornness were the only things stopping her from returning to the safety of the family home. There were, she says, anxieties. Plenty of those. Teenage dreams so hard to beat? Well – yes, actually. It’s a philosophy that still stands – that idea of music as a mood-altering, soul-saving outlet for bands and fans alike is alive and singing in the joyous rush of Kid Wave songs such as the breaking waves of sound on the jangling ‘All I Want’, the yearning ethereal pop of ‘Gloom’ or the chiming fuzzed-up pop riffs of ‘Wonderlust’. Nevertheless it’s an achievement made all the more remarkable by the fact that 22 year old singer/songwriter Lea Emmery and guitarist Mattias Bhatt hail from the south-east coast of Sweden where sub-zero Baltic winds blow in to freeze the land for several months of the year, and that this debut was recorded in Stockport during the darker days and crepuscular nights of a dank English winter. Kid Wave craft slacker indie rock and transcendental dream-laden pop of a distinctly early 90s bent – music to lose yourself in and give your life to. We hear shades of Lush and Dinosaur Jr. in their sonic sunshine, though other ears might recall PJ Harvey, The Lemonheads, The Breeders, Pavement, Teenage Fanclub. But these are all bands largely operational before the members of Kid Wave were even born – artists who singer Lea readily admits she doesn’t always necessarily know much about – so let’s not get too entrenched in nostalgia for days gone by. The one thing that perhaps unites this music of the past with the Kid Wave’s effervescent present is an infatuation with melody; this quartet never sacrifice the song for volume or let the feedback do the work. Because at the centre, beneath the shoe-gazing dynamics and the dark lyrical undercurrents that speak of existential quandaries and the confusions of young life in the 21st century, is a big beating gorgeous pop heart. ‘Listen To Her Heart’ – Kid Wave and Ben Romans- Hopcraft (Childhood) – Tom Petty cover by Kid Wave featuring their Childhood friend. THIS RELEASE IS AN EXCLUSIVE RECORD STORE DAY 2015 TITLE AND WILL BE AVAILABLE IN THE SHOP AT 9AM ON SATURDAY 18TH APRIL. IF WE HAVE STOCK LEFT IT WILL BE MADE AVAILABLE ONLINE AT JUST JUST BEFORE MIDNIGHT ON FRIDAY 23RD APRIL.